A comment I frequently hear from those who have just purchased a telescope is this: "I’ve seen the moon and a few planets … Venus, Jupiter and Mars … but I can never find Saturn. I’d really like to see the famous rings that encircle it, but I can never seem to readily identify it." It's a valid complaint, but this week you may have a chance to see the ringed planet for yourself, weather permitting. Unlike Venus and Jupiter which can be immediately identified by their great brilliance, or Mars by its distinctive fiery orange color, to the naked eye there really isn’t anything distinctive about Saturn. It appears as a bright "star" shining with a steady, sedate yellow-white glow, but it really isn't all that eye-catching. Indeed, many night sky neophytes to astronomy may have passed over it visually without knowing exactly what it is. Some nearby benchmark would certainly help to guide one to it. On Wednesday night (July 25), you’ll have two benchmarks to lead you to the solar system's "lord of the rings." As a preview to Wednesday's night sky Saturn hunt, the online Slooh Space Camera, which offers remote-telescope views of the night sky, will webcast live views of Saturn, Mars, the moon and the star Spica from its Canary Islands Observatory off the west coast of Africa. The webcast begins at 5 p.m. EDT (2 p.m. PDT, or 2100 GMT) and can be accessed here: http://www.slooh.com. As darkness falls, look toward the west-southwest sky. Roughly one-quarter up from the horizon to the point overhead will be the moon, just hours from attaining its half or first quarter phase. To the moon’s upper right you’ll see two bright star-like lights. The lower one (the one closest to the moon) is actually a star — the bluish first magnitude star, Spica in the constellation of Virgo. Spica ranks 16th among the brightest stars in the sky. The light you see coming from Spica started on its journey to Earth 260 years ago, when Benjamin Franklin was dabbling with electricity and the Liberty Bell arrived in Philadelphia. Above Spica , the "star" farthest from the moon and shining sedately with a yellow-white hue is — you guessed it — Saturn. It shines just a bit brighter than Spica. With the planet properly identified, night sky observers with a telescope can try it out on Saturn, which is sometimes referred to as one of the grandest sights of the night sky. In order to see Saturn's magnificent rings, you’ll need an eyepiece magnifying at least 30-power. If you have a 2.4-inch telescope, your best view of Saturn will come at 60-power. With a 3-inch telescope, try 75-power; with a 6-inch, 150-power is a good choice. Right now, the north side of the rings are tilted nearly 13 degrees toward Earth. They haven’t been this wide-open in five years, so now is a good time to check them out. Something else to look for is a small star roughly four ring-lengths from Saturn. That’s not a star, however, but Saturn’s largest moon Titan,the only natural satellite known to have a dense atmosphere, and the only object other than Earth for which clear evidence of stable bodies of surface liquid has been found. During the next several weeks, there is another planet in the night sky to seek out. 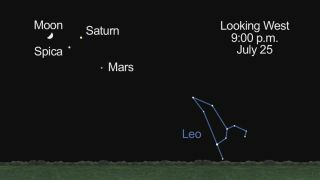 The planet Mars, which currently sits about 10 degrees (the width of your clenched fist held at arm’s length) to the west (or right) of Spica and Saturn, will be approach and in mid-August they’ll make for an eye-catching configuration in our early evening sky. Editor's note: If you snap an amazing photo of Saturn the moon and Spica that you'd like to share for a possible story or image gallery, send images and comments to managing editor Tariq Malik at tmalik@space.com.